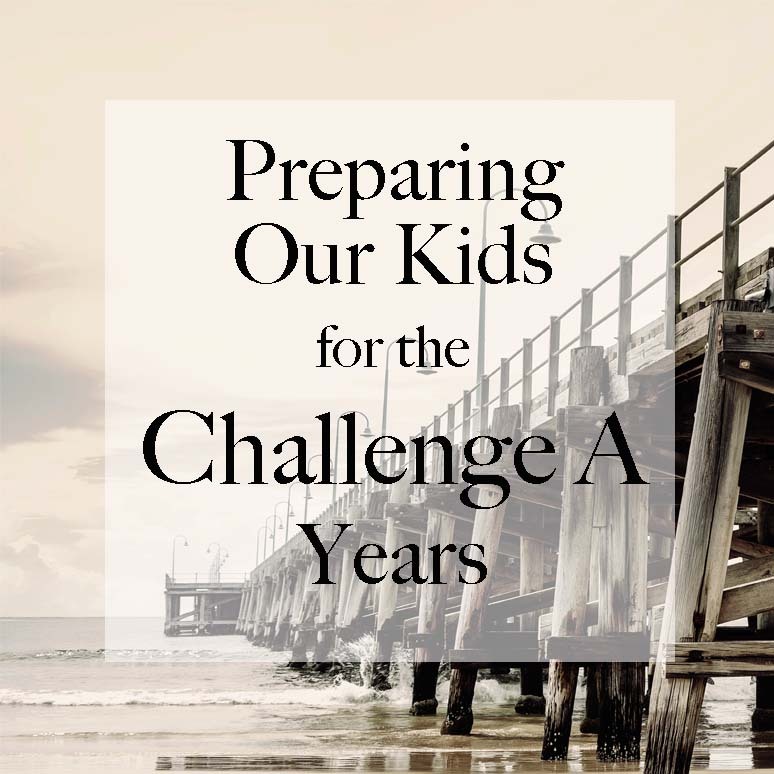 I jumped into the “Challenge Years” head-on with my oldest as the Challenge A Tutor. I have an amazing class of eleven students – all of whom are fairly extrovert. We have been growing in our discussion quality, and learning how to respect each other by not “stepping on” one another’s words. We have been stretched and challenge in so many ways already, and I am excited for what is yet to come this year. MAPPING – We had done a fair amount of mapping before – drawing the continents, the major lines of latitude and longitude, and a map or two every week for the last few years. But they weren’t really a main focus and I didn’t expect my kids to master them. This year, I am requiring that my F/E kids draw a map every day, and that they work to complete it accurately from memory. 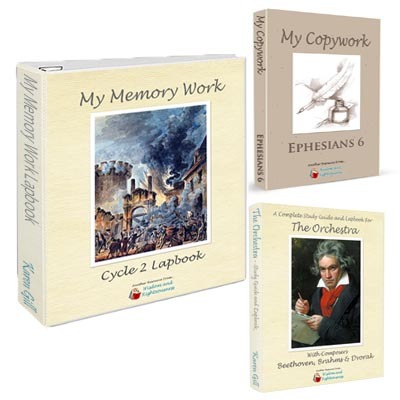 I invested in THIS SERIES (all of them) since I have five students who will use them over the next 15 years. Every day, each student (ages 6, 8, & 11) draw the entire U.S. from the first page to the end. The older two also label the abbreviations, but the younger just draws up to this point. This really only takes them 10 minutes a day. 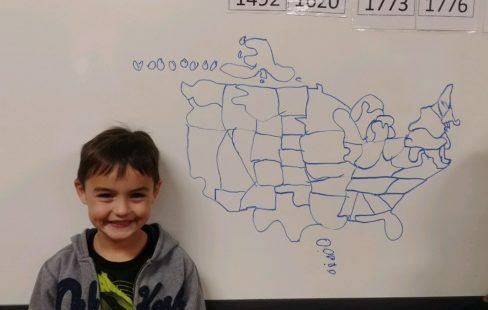 They have been doing it for four weeks (16 maps), and today, my six year old drew this map from memory in front of his Foundations class as part of his presentation. He was so proud! I was impressed (though he clearly needs to work on Utah and Arizona). To get to this point, I really just hand him the book, and he turns the pages as he draws each piece. I haven’t invested much time at all, and yet he has experienced much greater success than any other year. I will be working towards getting him to label them, though he can verbally tell me each one already. When they master the U.S., we will work on attaching Canada. By week 7 of Challenge A, the students have already been expected to master Canada, the US, and Central America and the Caribbean. They not only have to list all of the states and countries, but also all of their capitals and major features. Not too hard for the U.S. if they were in Foundations, but it is a lot harder for the rest of the world. Knowing my boys will have this foundation will make it so much easier for them and give them more confidence in Challenge A. 2. LATIN – I know that a number of families use a latin curriculum in the younger years. We had started with Song School latin, but didn’t stick with it. It seemed like so much busy-work, and I preferred my littles playing and discovering more. If another parent asked me, I personally would still avoid another Latin curriculum. I just think there are more efficient ways to prepare your student than spending 30-60 minutes every day on someone else’s plan. So what would I do (and what I am now doing)?…. I am having my Essentials age student fill out a latin chart with all of the declensions. 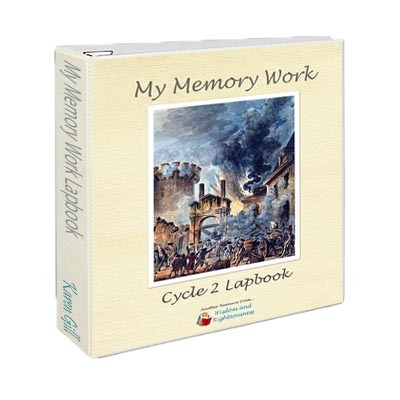 You could just stick to the Foundations memory work – that would be an excellent start. But after 7 weeks of Challenge A, I now know that there are caveats to each declension, so I am having him fill out all of the forms of each declension. If he copies this chart once a day it literally takes him less than 5 minutes, and it would be an unbelievable boost for him in Challenge A. If he masters that, we will work on the Conjugation chart. In addition to charts, I am having him drill some latin vocabulary using the Quizlet app on my phone. Quizlet is such a great program! It has built-in methods to test if you know the terms or not, and the lists are already pre-loaded! (just search for Challenge A Latin). In just a couple minutes a day, he can master most of the vocabulary, and he doesn’t mind since it is an electronic review. He still has 2 years of Essentials left, so in 7 minutes a day, I know my Essentials kid will be able to easily shrug off Latin in Challenge A as no big deal. Totally worth it! From my perspective as a Challenge A Director, Latin & Geography are probably the most time-consuming and challenging for kids in Challenge A. 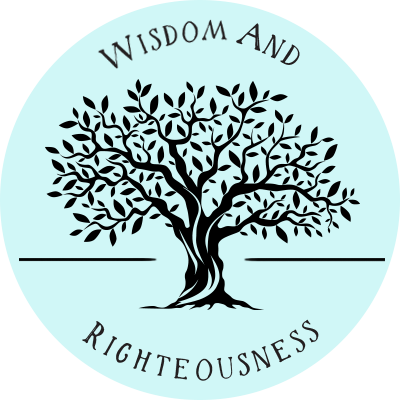 All of the other subjects are fairly easy or manageable for them, especially if they have been through Foundations and Essentials. The Challenge A students in my class seem to easily integrate what they learned in IEW into their science papers each week. In addition, the presentation skills they used in Foundations are effortlessly demonstrated each week in their math and research presentations. Their Essentials grammar work makes identifying the parts of speech in Latin less intimidating. It is an exciting thing to see so many pieces of their earlier education years merge together into their studies this year. Be encouraged and persevere in the things that matter! May the Lord bless your studies and the souls around you! Where can I find a Latin chart with those declension caveats?? My firstborn heads to A next year with me as director so this was so helpful!! I second what Jennifer Scott said above! Would you mind directing me toward any charts you think are helpful? My oldest is also in Challenge A and doing well, but I have 10 year old twins who will be in A in two years, and I think it will be much more challenging for them. I am currently having them do the yellow book in Song School Latin but, like you, feel that it is really not a good preparation for what their sister seems to be doing in Henle. I appreciate any advice! Thank you so much! I really appreciate it and I love your blog! This is so helpful. I’m currently directing F/E and shared your posts with my community. I echo the previous comments. I would love a Latin chart that my 9 year old can fill in every day. My 12 year old is in challenge A now and I will agree that the Latin and Geography have been the most difficult to master. Thank you for your I sight. Hi Julie! 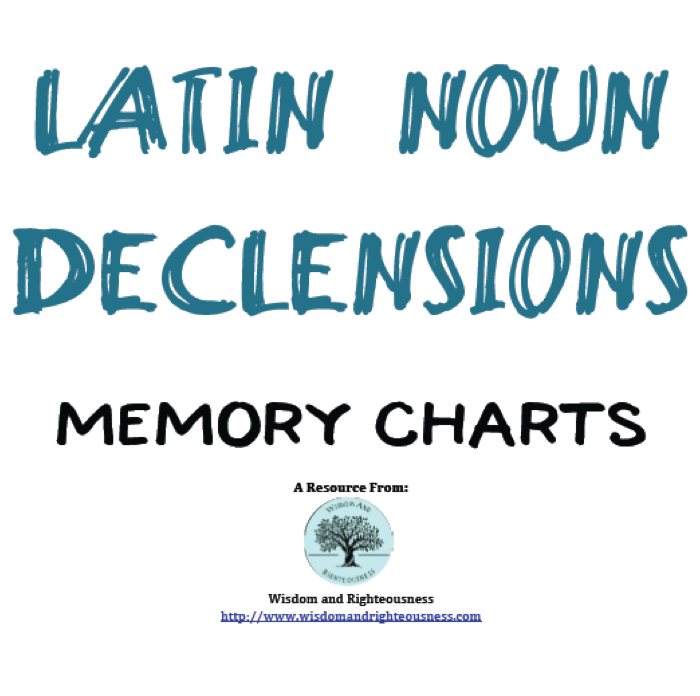 Check out the free download for the Latin Declensions in the shop! Love this post…and look forward to more of your thoughts in the weeks ahead. My son is 10 and I’m on the hunt for information and guidance, on what I can do now to help him during challenge, besides just know the memory work. Thank you so much for writing this post!! My son will be in Challenge A next year. This is helpful.I, too, would love a source for the Latin chart you are talking about. Hi Sue! I’m happy to provide that for you! A free link has been added to this post! I love you for this post! Thanks for helping me focus even more on what we need to refine in the last few years of Foundations. Your blog is a huge blessing!